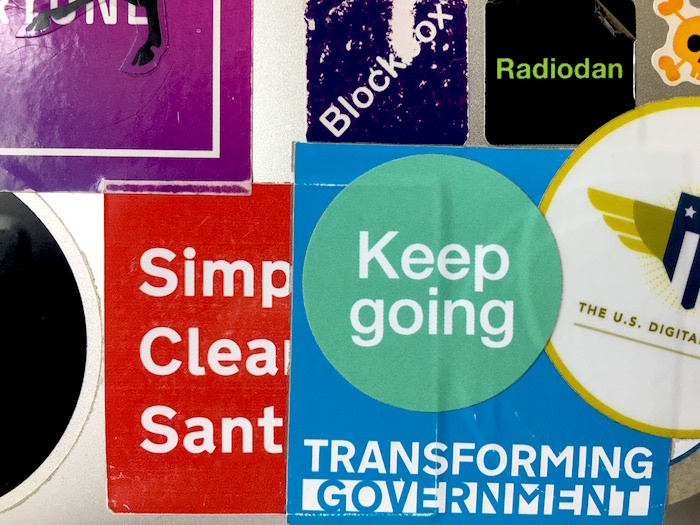 Back when GDS was still young, the team I worked with earned a nickname: “the department of stickers.” Ha ha, yes. On that team were talented producers and designers who did everything: came up with the right words, arranged for each sticker to be designed, paid for all the stickers to get printed, and kept all the stickers in a box under the desk. People often think stickers are a frivolous thing. A bit of throwaway fun. A waste of money. They make people smile. Things that make your team smile are a good investment. Some stickers are deliberately exclusive. They’re only intended for the people who worked on a particular project. NASA’s mission patches are the inspiration here. A sticker like that is a tiny reward, a marker of significant work that deserves to be marked. At the same time, other stickers can encourage inclusiveness. If you’re growing a team, or if your team is less cohesive or more widely geographically spread than you’d like, a few stickers can help members of that team recognise one another. Stickers can help create “teaminess” where little or none existed before. Stickers like that become tokens that represent something more - a shared experience, a shared set of memories that only people who worked on that project will remember and understand. A sticker, like a web page, can be a conscious act of institutional memory. As the owner of the sticker, that’s what you’re hoping for. If someone asks you that question, you get a chance to fill in the rest of the story, to explain the rest of the joke. Stories like that spread fast. Stickers help them spread faster and further. A couple of examples: Users, not customers and What’s the user need? People like it when leaders have a clear vision, and express it well. Stickers are good at that. They’re an incredibly simple and effective way to bring about cultural change and new ways of thinking in an organisation. The ones GDS made helped to do that within GDS itself, and more widely across other government departments and internationally. A few of my favourites: BE BOLD, Make things open, it makes them better, Look sideways, and the Practical Action stickers made by Alyson Fielding. 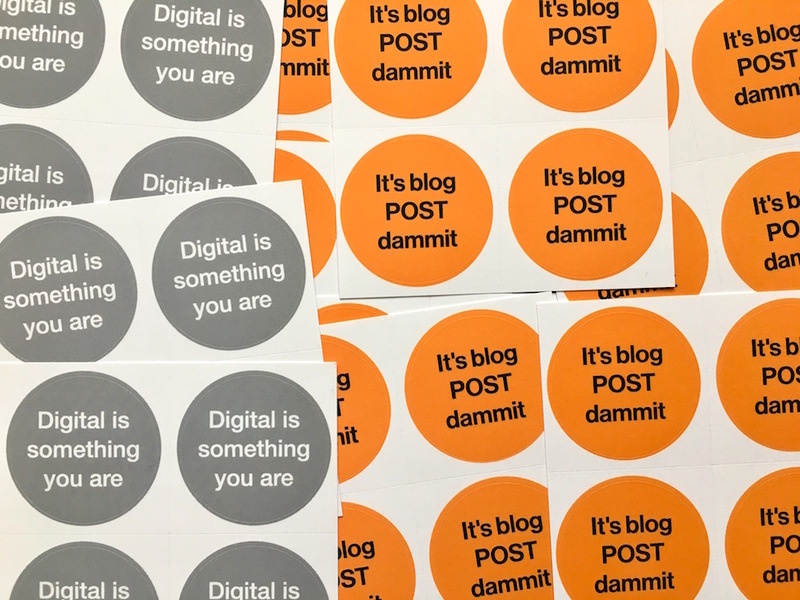 Stickers can be a useful tool for building, reflecting, and yes, shaping the culture. If you can condense your corporate vision into something short enough to fit on a sticker, that will be more successful than a wordier vision statement stuck on your website’s homepage. Stickers aren’t such a waste of money after all. Thanks to Zara Farrar, Olivia Steatham, Sarah Stewart and Jacob Grantham for reading drafts of this and making it better.